The Grand Canyon! The Big Ditch! The Most Beautiful Place I Have Ever Been! 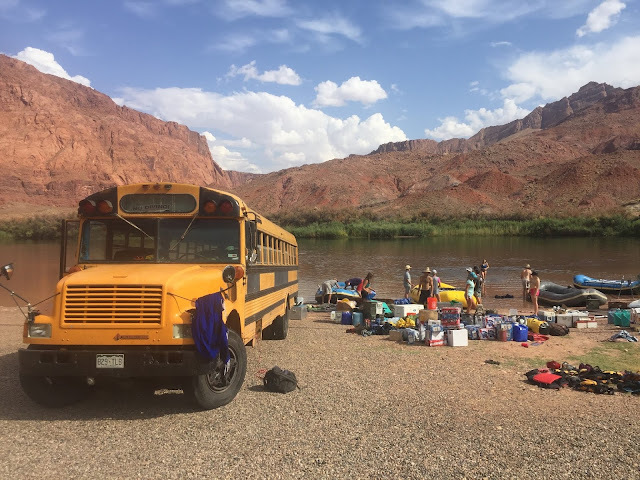 Between July 29th and August 17th, I went on the most exciting trip I have ever been on, a private trip with some of my best friends rafting the Grand Canyon for 15 nights and 16 days. You might notice those dates don't add up to 15 nights and 16 days. That is because the trip started bright and early the morning of July 29th with a 17 hour drive from Boulder, CO to Flagstaff, AZ in my good friend's, Spencer Lacy's, school/river bus. The planning/packing that went into the trip is an endeavor I don't necessarily want to write about, though it was quite a feat! After our drive we arrived at a Walmart parking lot in which we slept for the night with plans to get up early and get to the river put-in. That is just what we did, after we picked up a handful of friends from the airport and one rental raft from a nearby gear shop. At the put-in, we proceeded to rig the rafts and unload the bus. The first few days of the trip were similar to entering a new world. The massive canyon walls towered beyond view. In fact, the tiers of the canyon were so large that for most of the trip we could not see the rim of the canyon. The biggest surprise of the trip for me was the endless number of slot canyons that we hiked. We averaged two hikes per day of various slot canyons that fed this enormous portion of the Colorado River. The hikes varied from 5 minutes to 13 hours. Each one was unique and just as beautiful as the last. Halfway through the trip we had a group exchange. 14 people were invited on the trip that could not get all 16 days off of work. Those 14 people were split into two groups, "First Halfers" and "Second Halfers." When the first half of the trip was over, the First Halfers hiked to the rim of the canyon and headed to their respective homes from there. 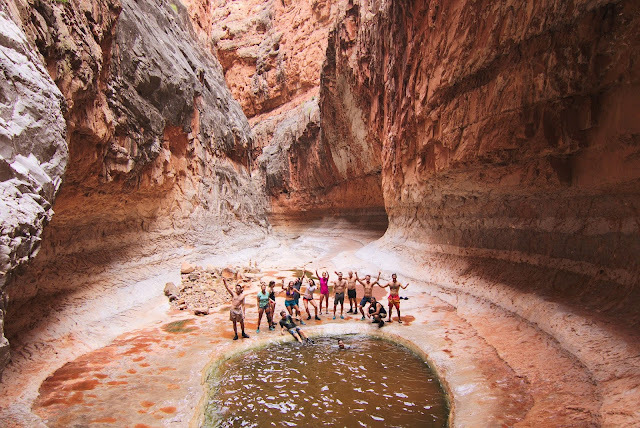 Simultaneously, the Second Halfers were hiking down from the rim of the canyon after a 24 hour endeavor of there own to assemble and travel to the trailhead at which they started their hike. We planned to meet the new group at Phantom Ranch, the same place we dropped the First Halfers off to begin their hike out. Fortunately for me, one of the First Halfers was the captain of one of the boats on the trip. Since he was leaving, we needed someone to captain that boat for the remaining 150 miles of the Grand Canyon. I was the only person on the trip that was not already captaining a boat that had even the smallest amount of experience rowing through large rapids--let me assure you, my experience was indeed very little. Nonetheless, I grabbed the oars after having practiced for the last three days on some of the smaller rapids. 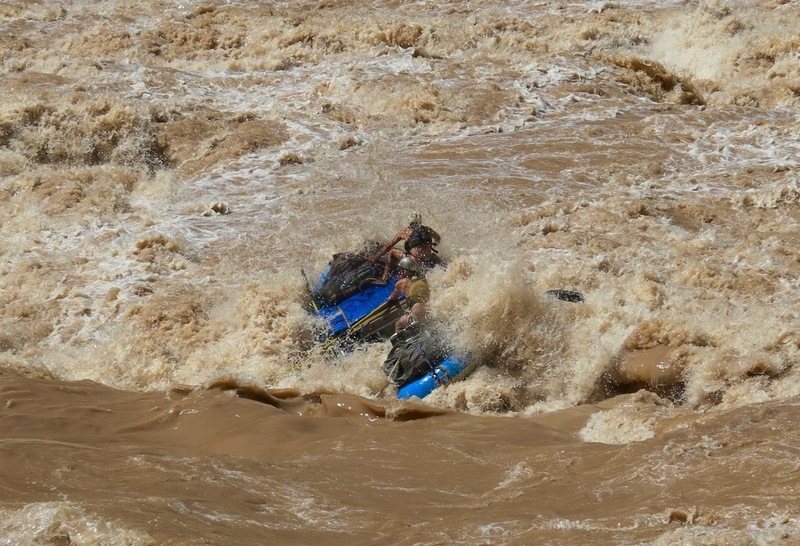 The day of the exchange was one of the biggest days of rapids that we saw on the trip. We had a class (8), followed by a class (9), followed by a class (7). Note, the rapids on the Grand are rated on a scale of 1-10. Needless to say, I had my work cutout for me. The first two rapids went fairly well. I was nervous beyond belief but I rowed well and my passenger, Lance Ostrom, distributed his weight perfectly. On the third rapid of the day, I flipped the raft. It was abrupt. It was violent. It was possibly one of the most fun times I have ever had. Each rapid I rowed, I learned a little more about the techniques of rowing. That day was the only day I flipped. Each rapid I grew more and more confidence though always remembering to cherish my respect for the power of the river. 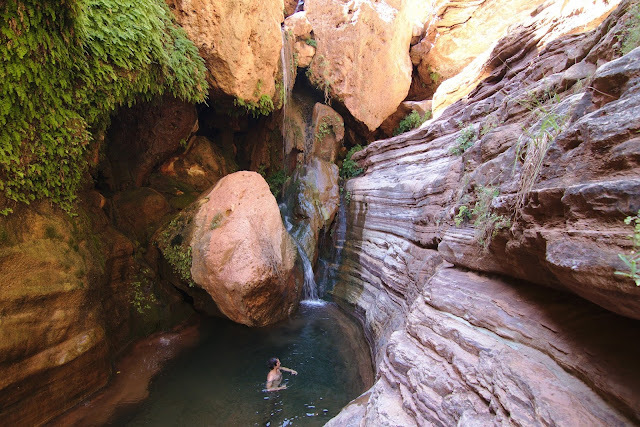 The campsites throughout the Grand Canyon were stunningly beautiful. Each night we hosted a different campsite averaging 14 miles further down river from the last. 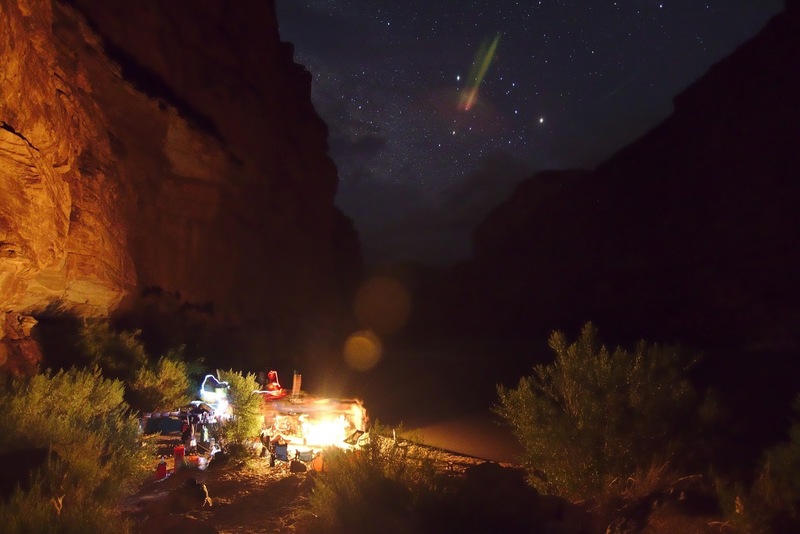 The nights typically consisted of hanging out with the group, having a few drinks, making dinner (if you were on kitchen crew on that particular day), and then falling asleep, unless of course you had the energy to look at the beautifully bright stars in the canyon sky. The trip was enlightening to say the least. It was the perfect amount of time to spend completely remote from society after having spent four years working incredibly hard in engineering school. Though, after our 17 hour drive home, I longed for the canyon. 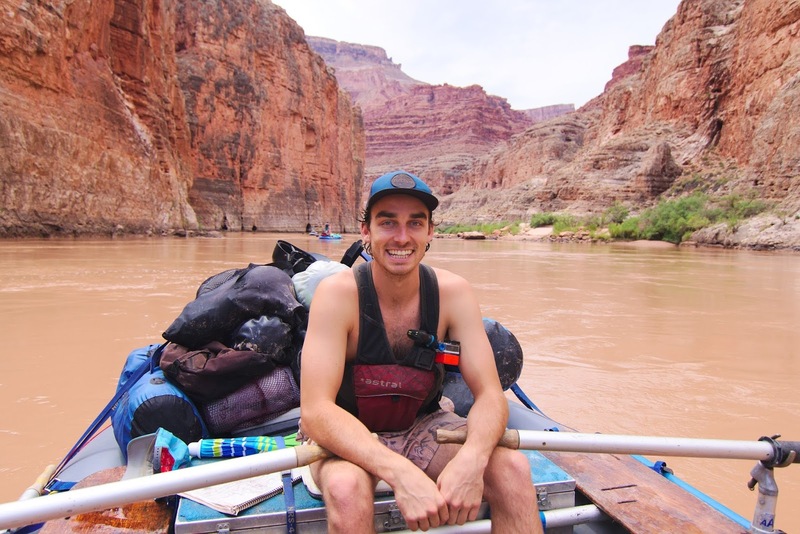 Since the trip, I don't think I have gone a day without thinking about what an amazing experience it was to row through one of the deepest canyons in the world. The amount of beautiful natural phenomena in that canyon is mind numbing. The amount of work that went into planning this trip is comparably hard to fathom. This brief description does not do the canyon justice, but then again, I don't think all the pictures and writing in the world could.